Imagine a world where a McDonalds or a Taco Bell couldn’t be found on every corner. Recent news coverage cited a report that showed, for the first time in history, Americans spend more money on eating out than on groceries. In stark contrast, the convenience of a fast food restaurant—let alone, a supermarket—just doesn’t exist for some three billion people around the world. Even where fresh food is available, extreme poverty only prohibits adequate nutrition. The children of Teays Valley Church of God in Scott Depot, West Virginia, have decided to do something about the problem. They’ve raised money to purchase a cow. A one-time donation of food and money can mean the world to families struggling to survive. But in many parts of the world, sustainable food and income can mean so much more. So Revved Up, the children’s ministry of Teays Valley Church, chose to partner with an organization to raise money to purchase a cows. Products like milk, butter, eggs, cheese, and honey offer a steady source of nutrition to families that receive animals from Heifer International. Children at Teays Valley have discovered the power of not only providing food for families, but also a stream of income when these products are sold in the marketplace. 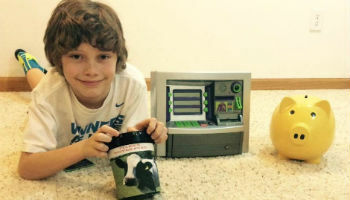 Fifth grader Tyler Weiford is one student who has taken the mission seriously.While it will take five hundred dollars to purchase a cow, he’s already contributed far more than his initial nine dollars. “When he turned his money in, Jodi Gramlich, the church’s children’s pastor, challenged him to earn fifty dollars more by April,” Pastor Melissa Pratt explains. “He accepted the challenge, and his mom created a little bank marked, ‘Tyler’s Heifer Fund.’ In no time, Tyler’s piggy bank was full. When he went to count it, he was astonished to find he had collected an additional seventy-seven dollars.” According to Tyler’s mother, this chunk of change included all of his tooth-fairy money and birthday savings. Tyler challenged his Revved Up peers to empty their piggy banks, as well. The goal of five hundred dollars was met, and now they’ve moved on to raising money for chickens and goats. Perhaps we can learn something from Tyler. Often the most enthusiastic hearts for the work of the Lord come from children. “Kids are far too often overlooked as potential ministers of today because of age and ability,” Melissa explains. “But Pastor Jodi has found that when given the opportunity to imitate Christ to others, kids not only show up, but show out.” In the past year alone, Revved Up children have partnered with a missionary to raise five hundred dollars for Bibles to be distributed in China and Costa Rica, sent baby clothes and blankets to children in Honduras, prepared and sent shoeboxes full of supplies to Mexico, and they continue to support missionaries in four countries. Jesus is the subject. His heart for children is clearly recorded in the gospels, and today Teays Valley Church of God is exercising that same passion. “God does not call only adults,” Pastor Jodi Gramlich insists, “God calls those who are willing to go.” Are we willing, Church of God? This entry was posted in All Church of God, Northeast and tagged children, Jodi Gramlich, kids, Melissa Pratt, Scott Depot, Teays Valley Church of God, West Virginia. Bookmark the permalink.